Nationals ace Stephen Strasburg has regained his dominant form thanks to his changeup. Fantasy baseball owners should take notice. Stephen Strasburg would likely be fine just as soon forgetting the first two months of the 2015 season. They were, inarguably, the worst two months of his major league career, as he amassed a 6.55 ERA and 1.72 WHIP in 47 1/3 innings. While Strasburg won’t necessarily be reliving any of those starts, it’s good for him to remember them. Quite simply, nothing was working for him in those 10 trips to the mound. By remembering what gave him so much trouble in April and May of this year, he can make the necessary adjustments to have success in the second half. He seems to be on that track after his first two starts since coming off the DL. Strasburg is one of our Pitchers of the Week, which we’ll get to in the next section. I don’t want to take away too much from that, but he won both of his starts, striking out 15 batters and allowing a total of two runs, eight hits and two walks in 12 innings. Strasburg may sit in the mid-90s with his fastball, but it was his secondary pitches, specifically his changeup, that helped turn him into an ace in the majors. For the first two months of 2015, that changeup abandoned him. Check out the pitch’s whiff rate by season, going back to 2012. Strasburg isn’t exactly getting tattooed on the pitch—hitters have a .233 batting average and .349 slugging percentage against it—but it has not been anywhere near the putaway offering this season that is has been his entire career. With counts extending longer than usual and Strasburg forced to go to other pitches, his results have suffered. Something interesting happened in Strasburg’s first start back from the DL. He threw 94 pitches in that start, a win over the Braves, and just four were changeups, with 61 being fastballs and 29 being curveballs. The changeup was back, to a degree, in his second post-DL outing, a victory over the Phillies. He threw 113 pitches against Philadelphia. Sixty-five were fastballs, 30 curves and 18 were changeups, good for 15.9% of his total pitches. Last year, the changeup had a usage rate of 20.2%. Here’s the best news about the changeup, however. It was good. Really good. Of the 18 he threw, 10 were strikes, including seven whiffs. The Phillies swung at it nine times and put it in play just once, resulting in a Ben Revere groundout. The changeup was clearly at its best right away in the win over the Phillies. He showed that in Ryan Howard’s first at-bat of the game. Strasburg used the changeup to get ahead 0-1, and it finally had the sort of movement we expect to see from the pitch. He then dropped it in on a 1-1 count, spotting it beautifully low and away, out of the strike zone. There’s nothing Howard can do but swing over the top. Now let’s take a look at the pitch with Strasburg in a plus count. After getting ahead of Howard with the change on the first pitch of the at-bat, he doubles up and comes right back with it on the second pitch. That one isn’t perfect in terms of location, but the movement is so nasty and the similar look to his fastball coming out of the hand completely fools Howard. How about we see Strasburg make someone other than Howard look foolish with the change, though. Here it is against Freddy Galvis on an 0-1 count. Again, Strasburg gets ahead and then buries the pitch. Galvis commits, and by time he reads changeup, it’s too late for him to do anything about it. 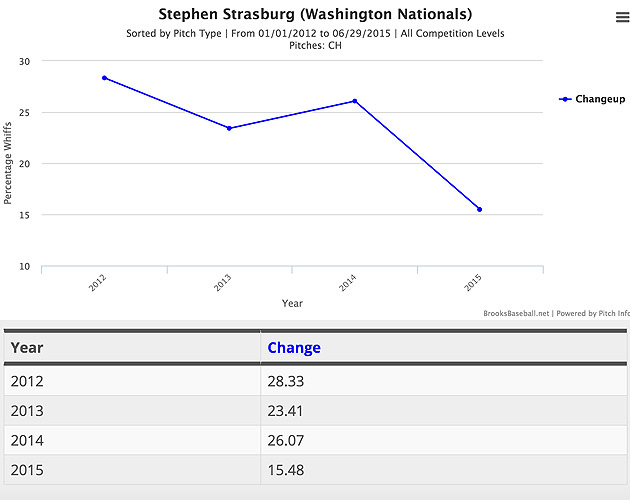 This is how Strasburg’s changeup looked last season, and why the pitch helped him strike out a career-high 242 batters. It’s also the pitch he needs to be the ace everyone expected him to be at the start of the season. If he can throw it for the rest of the year the way he did against the Phillies over the weekend, that’s exactly the pitcher he will be. Greinke made a couple of strong starts last week, but he was only rewarded with a win in one of them. He started his week by tossing six shutout innings against the Cubs, allowing three hits and two walks while striking out five. Unfortunately for him and the Dodgers, Jason Hammel was just as good, and the Cubs eventually won 1-0 in 10 innings. Greinke was even better in his weekend outing against the Marlins, throwing 7 2/3 shutout frames, striking out six and allowing five baserunners. His offense showed up enough in that one to help him notch his sixth win of the season. The 31-year-old Greinke is in the midst of what could end up being the best year of his career. He’s 6-2 with a 1.58 ERA, 0.91 WHIP and 94 strikeouts against 20 walks in 108 1/3 innings. The strikeout rate is down, so his FIP is more than a full run higher than his ERA, but he’s limiting hard contact, evidenced by a 26.8% hard-hit rate. Greinke is on the short list to start the All-Star Game for the NL. It’s a bit too early to say Strasburg is back in any more than the literal sense that he’s off the DL and in the Washington rotation, but it sure looked like he was back in the figurative sense last week. In his first start since missing about a month with a trapezius injury, Strasburg didn’t allow a run in five innings against the Braves, struck out six batters, and dealt with five baserunners. In his next start, a win over the Phillies, he surrendered two runs on four hits and a walk in seven innings, fanning nine. The Nationals and fantasy owners need Strasburg to pitch like the top-five pitcher he was assumed to be was back in March, and last week suggests he is back on that path. He’ll next take the ball on Saturday against the Giants. McHugh earned a pair of wins for the Astros last week, beating both the Angels and Yankees. He went eight innings in each outing, something he hadn’t done once all season until last week. He danced around nine hits and a walk to allow just two runs to the Angels, striking out six batters in an easy 13-3 win. He was nearly unhittable against the Yankees, surrendering one run on two hits, striking out eight. McHugh hit a rough patch in late May and early June, but he has now won three consecutive starts, allowing a total of six runs with 22 strikeouts in 22 innings in that stretch. For the season, he’s 9-3 with a 4.51 ERA, 1.27 WHIP and 84 strikeouts in 101 2/3 innings. His next start is Saturday against the Red Sox. Bauer had a rough week, taking losses against the Tigers and Orioles. He had one of his worst starts of the year with Detroit in Cleveland at the start of the week, allowing seven runs on nine hits and four walks in just three innings. It was the second time in three starts he failed to make it through four innings while allowing at least six runs. He was better in Baltimore over the weekend, but still gave up four runs on five hits in seven innings. Bauer, for the most part, has had a good season, and fantasy owners shouldn’t be losing confidence in him. At the same time, he’s on pace to blow by the career-high 153 innings he threw last season, so he’ll be entering uncharted water sometime in August or early September. That’s something to keep an eye on as the season progresses. He’ll take the mound on Friday against the Pirates. • BELLER: Pitcher Scouting: Why is Cashner's sinker more hittable this year? Shields got rocked in his only start last week, a loss to the Giants. They touched him up for seven runs on nine hits and two walks in four innings. Pat Murphy sent Shields back out for the fifth inning, but all he did was surrender a triple to Matt Duffy and single to Buster Posey before getting the hook. The one saving grace for fantasy owners was that he did contribute seven strikeouts, which came in handy regardless of whether your league uses raw strikeouts or K/9 as a category. The start was Shields’ worst as a member of the Padres, and his shortest outing in nearly two years. He has been good, but not great, this year, totaling a 4.24 ERA, 1.33 WHIP and 116 strikeouts against 31 walks in his first season in San Diego. He’ll draw a matchup with the Mariners on Wednesday. Pineda was so bad in his first start of the week that not even a great outing against the Astros over the weekend could save his overall performance. The Phillies of all teams knocked him around for eight runs on 11 hits in just 3 1/3 innings on Monday of last week, dealing him his fourth loss of the season. Pineda took his fifth loss on Sunday, but not all losses are created equal. He threw eight innings, allowing two runs on seven hits with eight strikeouts. It was technically a complete game, since the Yankees lost as the road team, Pineda’s first such outing of the year. Even with the dreadful start against the Phillies, he’s enjoying a strong season in his first full year on the mound since 2011, racking up a 4.08 ERA, 2.73 FIP, 1.24 WHIP and 95 strikeouts against 12 walks in 92 2/3 innings. Pineda’s next start is Sunday against the Rays. Moore looked great in his final rehab start with Triple-A Durham on Saturday, striking out eight batters in five innings. He also allowed two earned runs on five hits, but that doesn’t matter nearly as much as the fact that he threw 94 pitches and reported nothing wrong with the surgically repaired elbow on his left arm. Moore will rejoin the Rays’ rotation on Thursday, taking on the Indians. Somehow, he’s still available in about 70% of fantasy leagues, and that’s something that needs to change immediately. It’s not often that you can add a pitcher of Moore’s caliber from the waiver wire this late in the season. He made 27 starts in 2013, his age-24 season, racking up a 3.29 ERA, 1.30 WHIP and 175 strikeouts in 177 1/3 innings. Tommy John surgery cost him all but two starts of last season, but his velocity has been good during his rehab assignment, and he looks ready to pick up where he left off two years ago. This is the type of pitcher who should be owned in at least 85% of leagues, not 25%. Unless you’re rotation is absolutely stacked, there’s someone you can drop for him right now. We’re just 48 hours from July, the month during which baseball’s hot stove again kicks into high gear. Contending teams are always looking for bullpen help this time of year, and that makes the tradeable closers on non-contenders some of the most talked-about names on the market. Papelbon, Rodriguez, Clippard and Axford are the four pitchers who most snugly fit that bill this season. The Phillies, Brewers, A’s and Rockies are going nowhere this season, and they’d also have no reason to hold onto their respective current closers for the future. In the Phillies’ case, Papelbon’s contract is, in part, preventing them from making the moves that could get them back on the road to respectability. This sell recommendation is for those of you who own these closers in –only leagues. Any of the four could very well end up moving leagues by the end of July. There is, of course, no guarantee any of them gets traded, and they could always be dealt within their own league. However, you don’t want to lose an asset and get nothing in return. Over these next four weeks, consider getting aggressive with these closers in the trade market, especially if you can afford to deal them without getting a closer in return. Hitting Report: Will Steven Souza's power turn into 30 homers this year? In the interest of full disclosure, Garcia was going to be this week’s sell recommendation before it surfaced that he was dealing with a groin cramp during his start on Wednesday. Now that he’s again suffering from an injury, it will be awfully hard to sell him to anyone who has paid attention to his health troubles over the last three years. Garcia has been pitching quite well since rejoining the St. Louis rotation late in May, going 3-3 with a 1.69 ERA, 0.88 WHIP and 32 strikeouts in 48 innings. It’s the low strikeout rate, combined with his health history, that would have made him such an attractive sell candidate this week. For now, his owners should simply hold onto him until we get more information on his groin injury. The Cardinals are calling him day-to-day, but he was unable to throw a scheduled side session over the weekend. He is likely to start against the White Sox on Thursday, though. If he looks good in that start, get the trade talks up and running. You could be forgiven for thinking that Appel would be turning something older than 24 on his upcoming July 15 birthday. After all, he was selected three separate times in the amateur draft, including twice in the top 10. The Astros were only able to take him first overall in 2013 after the Pirates failed to sign him when they took him eighth overall the prior year. Appel’s pro career has not developed like many thought it would, especially those in the Astros’ front office who drafted him over Kris Bryant two years ago. It appears that the selection of Appel at No. 1 may finally be paying dividends. Appel struggled in his first outing with Fresno, allowing seven runs on seven hits in three innings. The good news, however, is that his stuff still plays to the majors. His fastball is a mid-90s offering that can touch 100 when he reaches back for it. Scouts consider his changeup and slider as plus pitches, as well. He still struggles with command, and that’s where he’ll have to make major strides to be with the Astros next season. He’s highly unlikely to make a fantasy impact this season, but he’s someone who should be on your radar late in the year in case he gets a September promotion. Dallas Keuchel just missed out on being one of the Pitchers of the Week after throwing a complete game shutout with 12 strikeouts against the Yankees. His slider was very good that night, as Alex Rodriguez found out in the fourth inning.